SQL injection is a code injection technique, used to attack data-driven applications, in which nefarious SQL statements are inserted into an entry field for an execution. 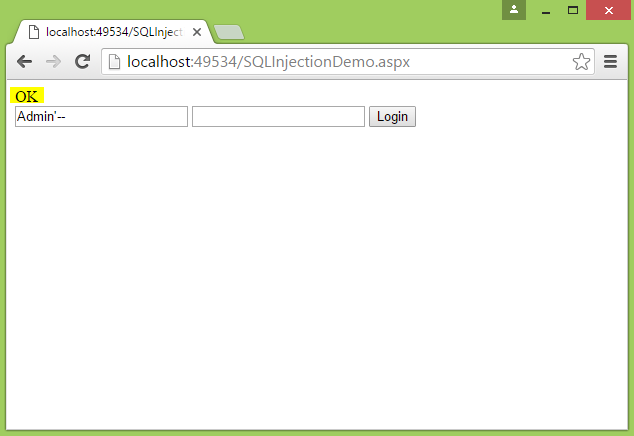 How to prevent SQL Injection to protect your data is being imparted through this article. For a few years, since I joined different technical community forums, I always see code provided by the thread starter which is prone to SQL injection attacks. Experienced developers keep providing those vulnerable codes which beginners will follow. They don’t understand what they are doing (code). They don’t mind about the code as long as it works for them. They are afraid to learn the right way because they might break their existing “working” code. For beginners, if you have been redirected to this article then you must have done something wrong with your code. This article will cover a few examples of how vulnerable code can break your data and how you can prevent it. According to documentation, SQL injection is a code injection technique which is used to attack data-driven applications where nefarious SQL statements are inserted into an entry field for execution (e.g. to dump the database contents to the attacker). These attacks allow attackers to spoof identity, tamper with existing data, cause repudiation issues such as voiding transactions or changing balances, allow the complete disclosure of all data on the system, destroy the data or make it otherwise unavailable and become administrators of the database server. The app runs smoothly and you get the expected result. Now look at the following figure below when a hacker inputs a malicious value. From the figure above, I just entered ';Drop Table Members - - into the TextBox and the values were appended into the core SQL. The result is definitely a valid SQL command that will be fetch records from SQL database and this can result in deleting your Members table. 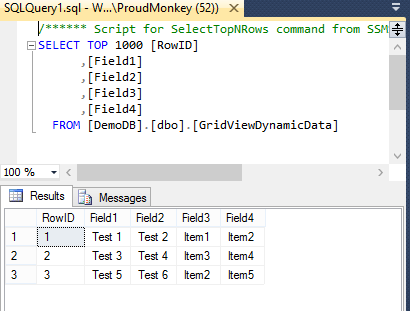 The single quote from the first character value represents a string delimiter as far as T-SQL in concerned and if you allow users to enter these without managing them then your data will be at risk. The double dash/hyphen (- -) character in the last part are basically used to comment out the preceding text in SQL. Now you might want to ask if, how a hacker knows your database table names? Well chances are they don’t but you should think about how you name your database tables. They are bound to be common sense names that reflect their purpose and it doesn’t take long to guess what they were, especially if you are using ASP.NETDB.mdf database which is publicly available to anyone. Renaming your database table names to something obscure (really-hard-to-guess-name) won’t solve the issue as someone can easily use random string generators. Appending those malicious values will always match at least one row, so the dt.Rows.Count will always be > 0. If you have noticed the remaining condition in your WHERE clause, it was commented out because of the injected SQL syntax in order to disregard the remaining condition. So if the LoginName “Admin” exists in your database then your dt.Rows.Count will be > 0 granting the hacker access to your website. The result in the figure above returns “OK”. It simply means that the hacker easily bypassed your authentication and is able to access your secured pages. Once they are able to access your secured page, they can potentially start defacing your site or they might break some data from your database or make some of the data disappear. Those examples demonstrated are just few of the typical examples of SQL Injection attack. Other avenues of the attack can be a value from forms, cookies and query strings wherein additional SQL command can be injected automatically to your core SQL command to change the behavior. 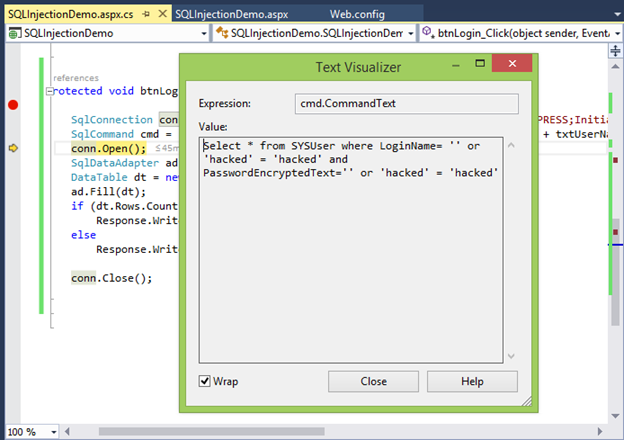 Escaping and replacing characters from a string cannot totally prevent you from SQL Injection attacks. 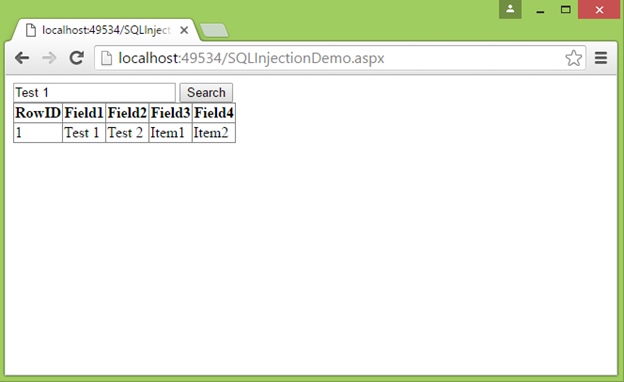 In order to prevent SQL Injection attack, make use of parameter queries. It is an ideal way to prevent such attacks. ADO.NET parameterized query is a query in which placeholders are used for parameters. The parameter values are supplied at execution time. When parameterized queries are sent to SQL Server, they are executed via system stored procedure sp_executesql. If you have noticed, there are few changes in the code above which makes the code more clean, maintainable and secured. 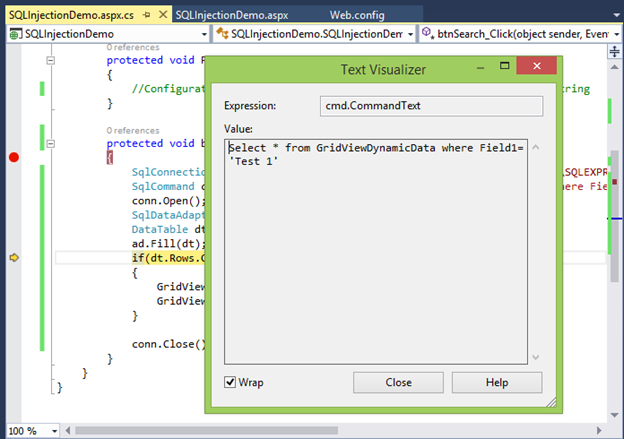 First is wrapping the SqlConnection, SqlCommand and SqlDataAdapter objects within the using statement. Since these objects implement IDisposable, putting them within the <using> statement will automatically dispose and close the connection of the object, after it is being used. In other words, if we use the <using> statement, we don’t need to explicitly dispose the object from the code because the <using> statement will take care of it. As an additional note, a <using> statement uses a try and finally block under the hood which helps in disposing an IDisposable object from the finaly block. Second is moving the connection string in a web.config file and reference it using the System.Configuration.ConfigurationManager class. 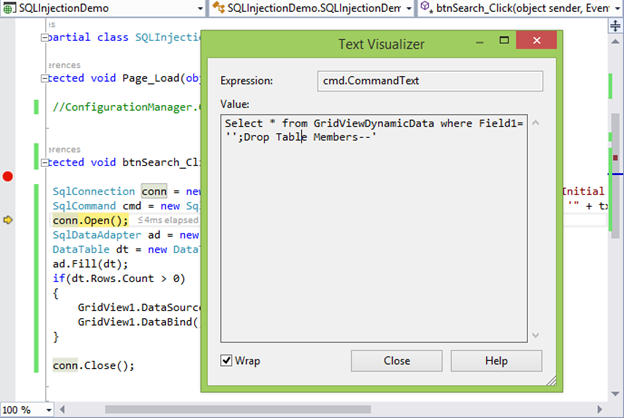 Third is moving the SQL query in a separate string variable called “sql”. Within that query, you’ll see the parameter: @SearchText which replaces the concatenated TextBox value. All SQL parameters should be prefixed with the @ symbol. Every parameter declared in your SQL query would expect a corresponding value so in this case, we have added the line sqlCmd.Parameters.AddWithValue("@SearchText", txtSearch.Text). The SqlParameterCollection.AddWithValue method basically adds a value to the end of the SqlParameterCollection. When the command executes, the parameters and the query text are treated separately. Any SQL syntax that the value of string might contain will be treated as a part of the literal string and not as a part of SQL statement. This is actually how SQL Injection is prevented. Make sure to do validations for all input types before passing the values to the parameters. This is because if your SQL parameter type expect a numeric value and you are passing a string type then your application will throw an error. Make sure to validate ranges and length of the characters to be entered from your input controls. Now that you know about SQL Injection attack, how it can potentially harm your website and data; I hope you will start using parameterized queries to protect your site from such attacks. Hence stop being lazy because you really have no excuse. To forums contributors', especially to the experienced one, please make it a habit to provide parameterized query code to beginners when you see code that is prone to SQL injection attack. We are a community so let’s help folks by guiding them to the right way. Again, make it a habit to always use parameterized queries. I hope someone will find this post useful.